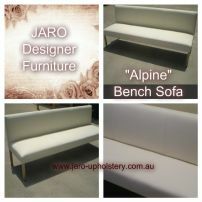 commented on "JARO's "Alpine" Boutique Leather Bench Sofa ideal for the dining room, foyer, lounge & small spaces!" JARO's "Alpine" Boutique Leather Bench Sofa ideal for the dining room, foyer, lounge & small spaces! The Alpine bench sofa is ideal for boutique homes, beach houses, holiday homes, prestige offices and waiting rooms, up market holiday units, foyers..... The Alpine bench sofa is available in a large range of leathers, fabrics and vinyls. Endless colours!